The rm3 Series Compact Microphone Amplifier Units were developed using the same electronics as the famous Raindirk Symphony consoles. We were originally commissioned by EuroSound mobiles in Holland to create 24-channel rm3 frames to compliment their existing Raindirk consoles and add on-stage extensions for concert recordings. 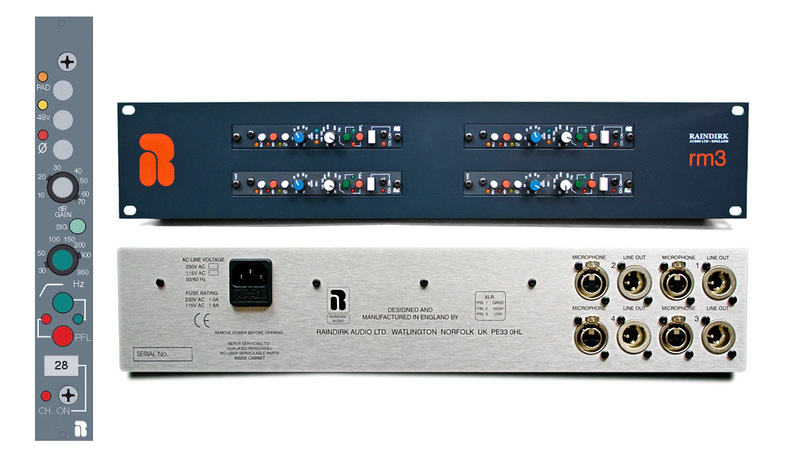 Now we are offering built-to-order 2 and 4 channel rack-mount rm3 units designed for use by recording engineers, producers and musicians who want to capture their recordings in excellent detail and clarity without undue colouration. Pictured above is the 2U, 4-channel version of the rm3, and to the right you can see the original module layout. The sound is simple and accurate and is ideal for live recording and studio applications producing a crystal clear interpretation of the sound source is without compromise and delivering the excellent frequency response you would normally expect from a large console. The units are built to a high specification and have a simple, elegant and very British feel to them!